Down in the sewers, Baxter wakes up. His repair systems had overridden all his other functions and forcibly powered him down. Much to Baxter’s surprise, he’s found that his right arm has begun to “grow” back. He wonders if perhaps he made his regeneration systems ‘too’ intelligent and now they’ve gained a sort of survival instinct capable of overpowering his own commands. In the apartment, Casey gets off the phone with Nobody. According to Nobody, there are no reports about Raphael in any of the police databases; in fact, there are no reports about ANY of them despite all the eye witnesses to the fight scene. 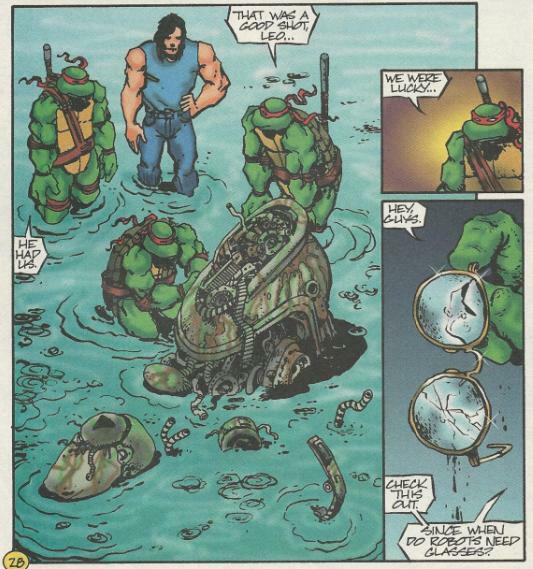 Donatello suspects a cover-up and suggests they find Baxter’s robot, as its origin may be the key to finding who took Raph and where they took him to. After they leave, the Feds staking out their apartment run a thermo scan, finding only a cat still inside. They’re ordered to ransack the apartment and take the cat (Kluuuunk! ), as it may be extraterrestrial. The Feds begin tearing the place apart, but their noise alerts Mr. Braunze down in the basement. He runs up to the apartment and tells them to drop Casey’s things and beat it. The Feds pull out their guns, but Mr. Braunze exhibits amazing physical prowess and takes them all down. He then grabs the Fed named William and orders him to talk. William refuses, but Braunze says he has no choice as strange hypnotic rays come out of his eyes. Back in the sewers, the Turtles and Casey follow the trail left behind by Baxter. They hear a tapping on a sewer pipe up ahead and follow the noise. They walk right into Baxter’s trap, as he was making the noise and leaving the trail to lure them. 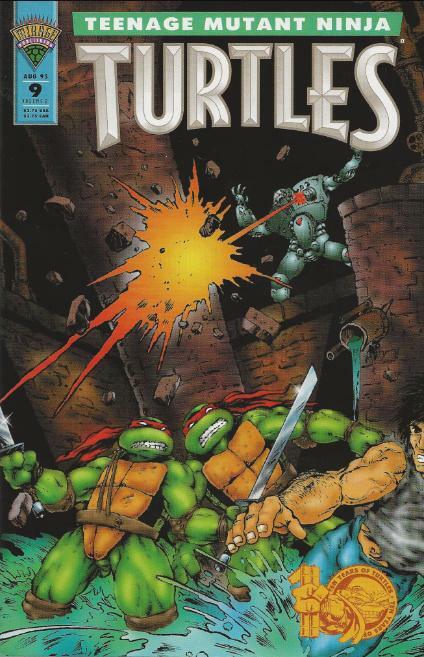 From a vantage point, he opens fire with his machinegun, forcing the Turtles and Casey to take cover, then runs down another tunnel. They follow him into a section of the sewer covered in ankle-deep water. They realize it’s a trap too late as Baxter appears on a ledge above them, holding a live power cable. 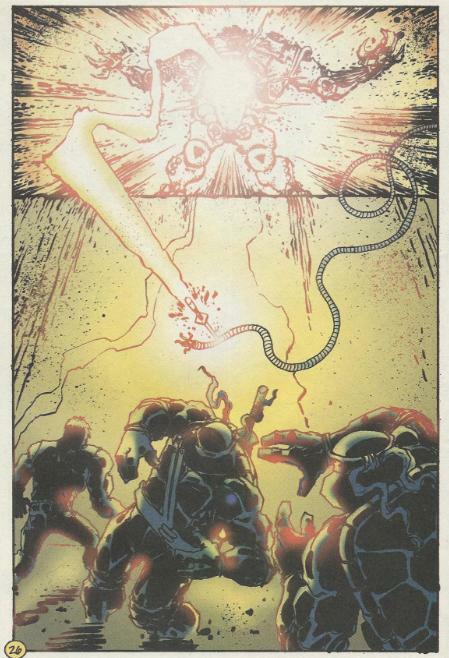 Baxter drops the sparking cable, but Leonardo reacts instantly by throwing his katana at it. His sword pins the cable to the wall and the electricity arcs up to the ledge, striking Baxter. The power is too much and Baxter explodes into a million pieces. Once the smoke clears, the Turtles and Casey inspect the remains of the robot. They find Baxter’s old glasses and wonder what they were doing inside the robot. Donatello discovers no central memory bank and comes to the conclusion that Baxter WAS the robot. However, with his brain missing or possibly destroyed, they’ve no one to question and are back to square one regarding Raph’s whereabouts. *This story is continued from TMNT (Vol. 2) #8. The story continues in TMNT (Vol. 2) #10. *The events of the miniseries Donatello: The Brain Thief take place between this and next issue, explaining what happened to Baxter’s brain and what the deal with his regeneration systems is. *Although the cover and indicia date this issue as August, 1995, the official Mirage TMNT website gives the proper date as December, 1994. *Due to a printing error, the “Bog” back-up was once again delayed and does not appear in this issue. The Baxter Stockman arc concludes, ending on a pretty exciting note, too. While the “rematch” doesn’t amount to much of a fight, I think we got the big action sequences out of our systems in the last issue. This showdown illustrates a bit more cunning on Baxter’s part, as he lures the Turtles into a trap he took time to set-up beforehand. It’s a crude one, sure, but it shows his resourcefulness. His first encounter with the Turtles was very brazen; drawing them out into the open with a show of force and trying to crush them all with nothing more than brute strength and weaponry. I rather liked seeing Stockman take a different approach for this issue’s big finish rather than just giving us another drag-out brawl. 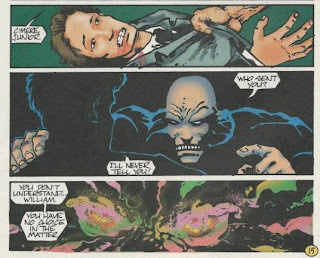 Speaking of “The Brain Thief”, well, it DOES follow-up on the big plot point that Baxter brings up at the start of this issue: his regeneration systems attaining low level sentience. Like a lot of plot threads introduced in this volume, the early cancellation left it unfulfilled. Much of the Tales of the TMNT (Vol. 2) era and its character-themed miniseries were spent tying up the myriad loose ends leftover from Volume 2’s unceremonious death, so whether you like “The Brain Thief” or not, it at least provides closure for something this issue spends 5 pages waxing on but never addresses again. Mr. Braunze, in case you don’t recall, was briefly introduced a couple issues ago in a bit of foreshadowing. He’s a big part of the DARPA arc that will finish off Volume 2, but since we haven’t quite gotten there yet, I’ll save my thoughts for now. All I’ll say is that he’s one earring away from winning the Mr. Clean lookalike contest. What else is there to say about this one other than KLUNK! They finally remembered Klunk! Sure, we don’t SEE him, but he’s mentioned. I was starting to worry about that little kitty. So the cover stated August of '95 but it actually saw print in December of '94? Man, I never thought Mirage could actually print an issue EARLY... especially 8 months early! As you stated, the cover (and inside back cover) says August 1995. 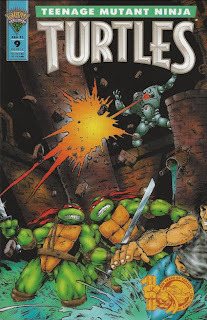 The inside front cover talks about a story that will appear "next month in TMNT No.10", while an ad in the back says #10 will be out "in two months" (the cover for #10 says Aug 95). There's also an ad for Usagi Yojimbo # 15 "coming this August". It's strnge that the gap between #8 (Nov 94) and #10 (Aug 95) wasn't adressed by Mirage in #9 or #10.